97 O how I love Thy law! For Thy testimonies are my meditation. Because I have observed Thy precepts. That I may keep Thy word. For Thou Thyself hast taught me. 103 How sweet are Thy words to my taste! Over 22 days (with a few Sabbath rests in the midst) it is my hope to soak in and meditate on Psalm 119. This is the longest chapter of the Bible with 22 sections. Each of the 22 sections is an acrostic in the original Hebrew language that alliterates each statement with one letter from the Hebrew Alphabet. In reading through this Psalm, one can find the meditations of the heart, the movements of the hands, & the all surpassing Grace of God.We love lots of things…we can admit that as human beings. Even if a person has no faith in God, they may have a “faith in love.” Love was never intended to be selfish on the part of the love giver because love seeks the benefit of the loved…even at the cost or sacrifice of the lover. While this is the virtue of love, there are benefits from love. These were never intended to be the purpose, mind you…but they are their, especially in the place of relationship and mutual love. In Mem (pronounced mame) the psalmist declares his love for the word of God because He understands the provision of God Himself for making His Words known to mankind. 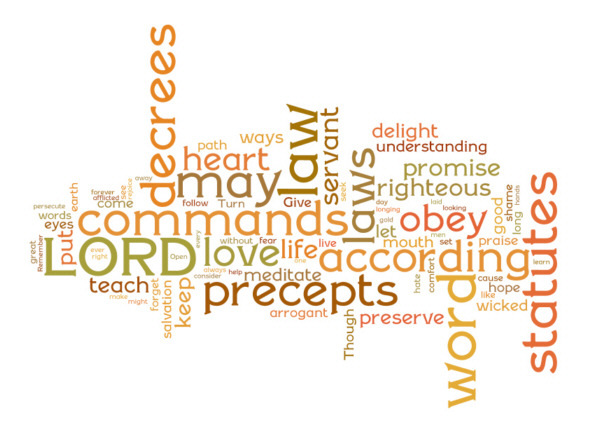 But the psalmist also understands and proclaims this “love with benefits.” Here are a few of those benefits listed from loving God and His word. The Word gives deep insight…in fact the student can learn more than the teacher if the desire and application is there. It does not make the student better than the teacher. The Word gives understanding… especially understanding over the experiences life, this world, the past, the present, the future, and the kingdom of God. This understanding is available to the desiring at any age. The Word gives alertness to danger & evil… it makes us aware of that which is harmful and that which displeases God. These are both sins of commission (doing what we are told not to do) and sins of omission (not doing what we are told to do). These are rebellion against God’s character, His grace, and His authority. He is Lord…we are not. This is love with benefits. While the benefits are never to be the priority or the desired outcome, God blesses those who love Him…with Himself…oh what greater benefit could we desire? Up to Heaven for His dear sake. This entry was posted in Faith, God, Gospel, Grace, Life. Bookmark the permalink.